Szeryk, a first-year member of the Young Pro Squad, joins the Young Pro Squad after a remarkable amateur career. The London, Ont., product set numerous records during her four seasons at Texas A&M, where she collected four collegiate titles. 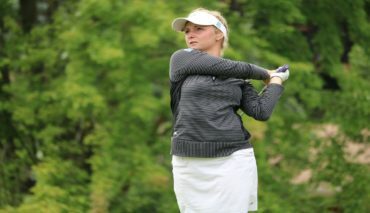 She enters her fifth season with Team Canada after four seasons with the Amateur Squad, finishing atop Golf Canada’s Amateur Order of Merit the past four seasons. 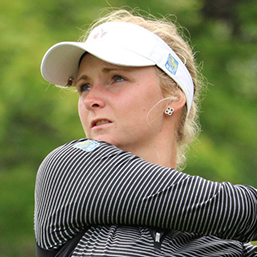 The 22-year old recently claimed her first professional win in her first professional start at the Cactus Tour’s Wildfire event. Szeryk’s younger sister Ellie is in her second year on the Team Canada Junior Squad. I got into golf when I was about 7 years old and my dad brought me out one day to just hang out with him and I really liked it so they put me in a summer camp and I liked it even more so I got a personal coach and stuck with it every since. I mark my ball with a Canadian quarter and on the back it has the breast cancer symbol and it’s a reminder of my Nana who beat breast cancer. I have a younger sister Ellie who is 16 and on the Development Squad for Team Canada. I would love to have Blake Lively play me in a movie. I played soccer for about 10 years when I was younger and loved it. I am also learning sign language. A picture of the new purse I just bought! I love that we have so many little boutiques downtown so there is always something new to shop for. I have a lot of superstitions like wearing my hair a certain way on a certain day or what shoes I wear. An index card with the Serenity Prayer on it.